Applications for the North London Pastoral Assistants Scheme have closed for the year 2017/18. If you would like to make an enquiry about the application process for 2018/19, please contact Fr Bruce Batstone: fr.bruce@hornseyparishchurch.org. Would you like to offer a year serving God’s people in some of London’s most diverse neighbourhoods? Are you exploring how God is calling you to spend your life? 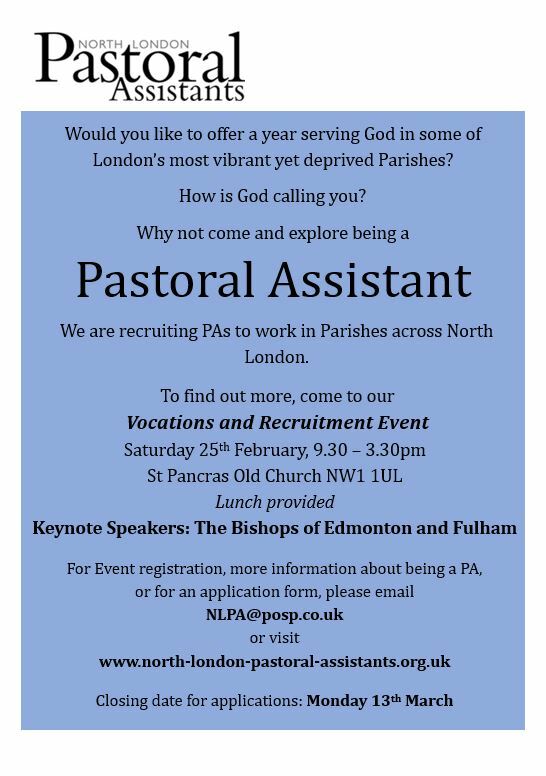 The North London Pastoral Assistants (NLPA) scheme has a vacancy in Hornsey which is ideal for an enthusiastic woman or man to come and join us from September 2017. Please see below for more details. We can offer you opportunities in preparing liturgy, leading worship, youth work and community ministry including YMCA chaplaincy. In addition you will receive full supervision, spiritual formation and theology sessions, a retreat in Paris, housing in Crouch End and full expenses. Hornsey Parish Church is a diverse community with a fairly large congregation representative of the varied place that Hornsey is: young and older; married, single and partnered; straight and gay; British and international. We welcome everyone who wants to come to be part of our family, and we are delighted to be forming part of the Hornsey Churches Urban Mission Scheme along with Holy Innocents, Holy Trinity and St Paul’s. Parts of Hornsey Parish are places of much wealth, drawing people from Muswell Hill, Highgate and Crouch End, but it is also a community of deprivation and poverty, sitting very much on the border between West and East Haringey. Within the parish is the ward of Campsbourne, which has recently been described as one of the poorest in Europe, and it is perhaps in our schools where we particularly see that rich diversity. Working in our church means being part of an already thriving pastoral team which includes a full-time curate, two Licensed Lay Ministers (Readers), a part-time Lay Schools Worker, a part-time Youth Development Worker and a volunteer Lay Chaplain who co-ordinates much of our pastoral work and acts as Sacristan. Also, the church has a part-time Halls Manager. The present parish priest, Fr Bruce Batstone, arrived at the end of 2011 from the Parish of Old St Pancras, where for eight years he worked extensively with their Pastoral Assistant Scheme. Like the other churches in the scheme, we offer opportunities to experience all the various aspects of parish ministry. This includes the leadership of worship and prayer, preaching and serving, participating in the life of our church school, pastoral visits, helping in co-ordinating a Winter Night Shelter for the homeless, chaplaincy at YMCA North London and local Air Cadets, ministry amongst older people and working with our community partners in a variety of ways. Our congregation includes many families, and working as a Pastoral Assistant here will mean joining a large and committed team of employed and voluntary people who deliver a very high quality programme of Christian formation to our younger church members, from two years’ old up to eighteen and beyond. Our church also has performing arts mission called Stages for Faith, offering opportunities for outreach to the community through regular high quality productions and associated events. Our musical life is rich and inclusive, with a very good choir and musical director whose talents complement the atmosphere of the services and which we hope are supported by the contemplative feel of the modern church building. Hornsey Parish Church is also the venue for many activities to support Spiritual Formation in the Edmonton Episcopal Area, co-ordinated by Fr Bruce, and as Pastoral Assistant you will be encouraged to help to organise Labyrinth workshops, days to resource spiritual direction, supporting weeks of accompanied prayer and much more besides. Whilst working extensively in this parish, you will have much involvement in our chaplaincy at YMCA North London and joint projects such as the Haringey Winter Night Shelter, as well as new projects that such partnerships will give birth to and nurture. As the Pastoral Assistant here, you will live in the Crouch End flat with your two colleagues, and meet with them and the clergy each day for Evening Prayer (Morning Prayer is said at the Parish Church with Fr Bruce and the Pastoral Team). You will receive expenses of £500 per month and your utility bills will be paid. A priest will supervise you regularly, encouraging you to reflect theologically on your role. This will be complemented by a monthly theological study seminar and a programme of spiritual formation sessions, equipping you with tools offered by St Benedict, St Ignatius and St Francis (amongst others) to contribute to the experience of discernment that such a year is inevitably about. Time really has flown by for me as Pastoral Assistant! I have really enjoyed my time here at Hornsey Parish Church, and it feels far too soon to already be writing a report for the APCM! My role has encompassed various different aspects of the parish’s ministry, which I will attempt to outline here. I spend several hours a week at St Mary’s, our parish Church of England primary school, with whom we have close links. I help Fr Bruce in leading assembly on a Monday morning at the Church Lane site; I lead sessions with Year 6 classes, helping to prepare them in reading and intercessions for our termly ‘Big Six’ Eucharist; I have also helped prepare 10 children from Years 5 and 6 to receive their First Communion; I have helped in assemblies at the Rectory Gardens site with Fr Bruce, Fr Ben, Naomi, and Gavin Childress, a local Baptist minister; and I have helped with less regular events, such as Donkey Day, when we process from Church Lane to Rectory Gardens with a donkey, as a re-enactment of Jesus’ entry into Jerusalem. We also have termly RE weeks, when I have gone into the Church Lane site with Naomi and taught the children Bible stories. Along with Fr Ben and Lotte, I help run our church’s Youth Fellowship, which is for children of primary school age and takes place on a Friday evening. This includes planning a variety of activities, from sports to board games to baking. In addition, we also have termly trips, often with the other three churches in the Hornsey cluster, such as bowling. I am also looking forward to organising trips up to Alexandra Palace when the weather gets warmer! While not a specifically Christian group, I believe Youth Fellowship provides an important space for children from both inside and outside our parish to relax and socialise in a safe environment, and shows the church as a friendly, open space for everyone. I co-ordinate, with Naomi, our children and young people in serving roles, and have also led Georgians sessions, such as one on the Ten Commandments. This coming term, we are looking at some different saints, which I helped organise along with Richard Williams and Annie Perkins. Finally, I have helped in organising various less frequent youth events, such as Youth Mass in conjunction with the other cluster churches, Messy Church, hosted at St Mary’s School, and our All-Age Advent and Holy Week workshops. Through principles of Godly Play, we have developed and are continuing to develop children’s spirituality and help them discover God. As part of the chaplaincy team with Fr Ben (chaplain) and Patricia Brown-Dankwa (my fellow chaplaincy assistant) at North London YMCA, I help provide a confidential, non-judgemental listening ear for residents and staff both at the hostel and the staff at the head office on Haringey Park. This is very important work because we provide an explicitly Christian presence in the organisation, and provide a space for residents to speak to someone outside the main structure of the hostel. A final important part of our chaplaincy is providing a prayerful presence in the hostel. We say Morning Prayer and Evening Prayer there four times a week (Tuesday evening (again, without me), Thursday evening, Friday morning, and Sunday evening), and we also pray with staff and residents privately if they ask. Part of our ministry at Snack and Chat, too, is a place for people to fill out prayer slips, which we pray when we say the daily office there. We also provide a space for staff to grow spiritually, with our prayer and Bible study group, where we have studied a significant portion of Acts and are currently working our way through Galatians, and also pray residents’ prayer requests. I serve at many services during the week, both at midweek Eucharists and in leading Morning and Evening Prayer, which form the basis of our worship here in Hornsey. I also serve every Sunday at the Parish Eucharist, in a variety of roles. In addition, I organise adult servers, especially now that we no longer have Vicki, and have said a temporary goodbye to Anna until she returns as Mthr Anna in July, and will say goodbye to Fr Ben in May. I have also been involved in planning more occasional services, such as around Christmas and Easter, as well as singing in the choir. With Debbie Langdon-Davies, I have helped lead a Pilgrim and Lectio Divina group in church on a Wednesday afternoon. We started this year with the Pilgrim book on the Ten Commandments, and then subsequently developed into a Lectio Divina group, using the previous Sunday’s Gospel reading as our source. I have also used these skills in leading two of the midweek Lent course sessions. Another part of my role here at Hornsey has been visiting people and taking people communion when they cannot get to church for a period of time. Sometimes this is in hospital, but more often this is to people in their own homes, usually when they are recovering from medical treatment. I also help with our monthly Eucharist at the Priory retirement home. I have had a great number of opportunities for personal development, in many areas, especially spiritual development. I have had, along with the other pastoral assistants in the North London Pastoral Assistants Scheme, monthly theological formation seminars with Fr Peter Anthony, usually based on a theological article or a book. Some examples of sessions that we have had include one on the diaconate, as well as one on the priesthood, when we read Archbishop Michael Ramsey’s The Christian Priest Today. I am currently reading C S Lewis’ Mere Christianity, ahead of a seminar that will take place in May. In terms of spiritual development, the North London Pastoral Assistants Scheme provides two seminars per term on different aspects of Christian spirituality, led by Fr Bruce. We have so far studied the Rule of St Benedict, and we have also looked at the writings of St Ignatius of Loyola; we will in the coming weeks be learning about Franciscan spirituality. I have also had the chance to grow within the guidance of this parish: I benefit from regular supervision sessions with Fr Bruce, who also helped me find a spiritual director, with whom I also have regular sessions. Furthermore, I have learnt a great deal from working with all of the ministry team here in Hornsey, and especially in the art of meditation and being silent! With Phil Harnett and Fr Ben, I have been heavily involved with our transition to ChurchDesk, our new database and administrative software. I have also coordinated, with Clare Goymer, the transition of the Sunday rota to ChurchDesk, while also including and being sensitive to members of our congregation who do not use computers. I also update the website weekly with details of our Sunday and midweek services, as well as upcoming events and ensuring that the church website is up-to-date and has seasonal images and information on it. I produce the weekly sheet for a Sunday, including details of parish services and activities for the upcoming week, and ensuring that everything that needs to be is included in the notices. In addition, I ensure the hymns, collect, readings, post-communion prayer, and the prayer list are updated for each week. Although the vast majority of my work is based in this parish, we join with the other three churches in the Hornsey cluster to say Evening Prayer on weeknights. I live in a flat in Crouch End with Millie and Stephen, my fellow pastoral assistants in Hornsey. It has been a real joy to serve at Hornsey Parish Church over the last eight months, and I will definitely be sad to leave when the time comes! I have learned a lot, and doubtless will continue to do so over the remaining three months of my time here. The experience will, without question, stand me in good stead, whether or not I go forward for training in the future.